 (a) The height of the blood column in the human body is more at feet than at the brain. That is why, the blood exerts more pressure at the feet than at the brain. 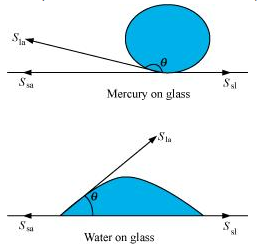 The angle of contact θ , is obtuse if Ssa < Sla (as in the case of mercury on glass). This angle is acute if Ssl < Sla (as in the case of water on glass). (e) A spinning cricket ball in air does not follow a parabolic trajectory. (a) When we blow over the paper, the velocity of air blow increases and hence pressure of air on it decreases (according to Beroulli's Theorem), where as pressure of air blow the paper is atmospheric. Hence, the paper stays horizontal. (b) By ddoing so the area of outlet of water jet is reduced, so velocity of water increases according to equation of continuity, Area × Velocity = Constant. 10.5. A 50 kg girl wearing high heel shoes balances on a single heel. The heel is circular with a diameter 1.0 cm. What is the pressure exerted by the heel on the horizontal floor? 10.6. Toricelli’s barometer used mercury. Pascal duplicated it using French wine of density 984 kg m–3. Determine the height of the wine column for normal atmospheric pressure. 10.7. A vertical off-shore structure is built to withstand a maximum stress of 109 Pa. Is the structure suitable for putting up on top of an oil well in the ocean? Take the depth of the ocean to be roughly 3 km, and ignore ocean currents. The maximum allowable stress for the structure (109 Pa) is greater than the pressure of the sea water (2.94 × 107 Pa). The pressure exerted by the ocean is less than the pressure that the structure can withstand. Hence, the structure is suitable for putting up on top of an oil well in the ocean. 10.8. A hydraulic automobile lift is designed to lift cars with a maximum mass of 3000 kg. The area of cross-section of the piston carrying the load is 425 cm2. What maximum pressure would the smaller piston have to bear? 10.9. A U-tube contains water and methylated spirit separated by mercury. The mercury columns in the two arms are in level with 10.0 cm of water in one arm and 12.5 cm of spirit in the other. What is the specific gravity of spirit? 10.10. 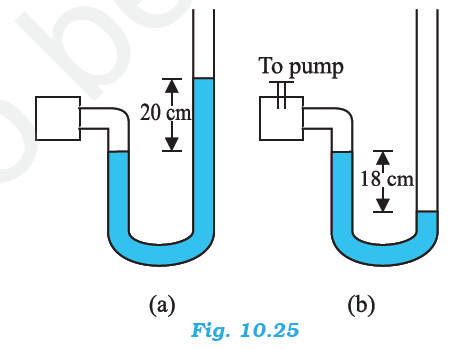 In problem 10.9, if 15.0 cm of water and spirit each are further poured into the respective arms of the tube, what is the difference in the levels of mercury in the two arms? (Specific gravity of mercury = 13.6). 10.11. Can Bernoulli’s equation be used to describe the flow of water through a rapid in a river? Explain. 10.12. Does it matter if one uses gauge instead of absolute pressures in applying Bernoulli’s equation? Explain. No, it does not matter if one uses gauge pressure instead of absolute pressure while applying Bernoulli’s equation. The two points where Bernoulli’s equation is applied should have significantly different atmospheric pressures. 10.13. Glycerine flows steadily through a horizontal tube of length 1.5 m and radius 1.0 cm. If the amount of glycerine collected per second at one end is 4.0 × 10–3 kg s–1, what is the pressure difference between the two ends of the tube? (Density of glycerine = 1.3 × 103 kg m–3 and viscosity of glycerine = 0.83 Pa s). [You may also like to check if the assumption of laminar flow in the tube is correct]. 10.14. In a test experiment on a model aeroplane in a wind tunnel, the flow speeds on the upper and lower surfaces of the wing are 70 m s–1and 63 m s–1 respectively. What is the lift on the wing if its area is 2.5 m2? Take the density of air to be 1.3 kg m–3. 10.15. 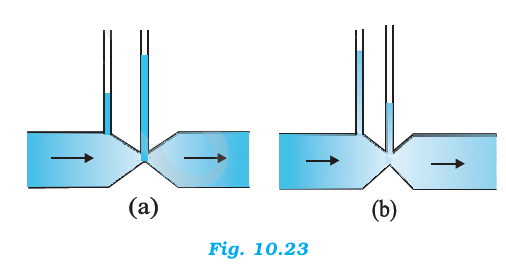 Figures 10.23 (a) and (b) refer to the steady flow of a (non-viscous) liquid. Which of the two figures is incorrect? Why? Fig. (a) is incorrect. Accoridng to equation of continuity, i.e., av = Constant, where area of cross-section of tube is less, the velcoity of liquid flow is more. So the velocity of liquid flow at a constriction of tube is more than the other portion of tube. Accroding to Bernoulli's Theorem, P + 1/2ρv2 = Constant, where v is more, P is less and vice versa. 10.16. The cylindrical tube of a spray pump has a cross-section of 8.0 cm2 one end of which has 40 fine holes each of diameter 1.0 mm. If the liquid flow inside the tube is 1.5 m min–1, what is the speed of ejection of the liquid through the holes? 10.17. A U-shaped wire is dipped in a soap solution, and removed. The thin soap film formed between the wire and the light slider supports a weight of 1.5 × 10–2 N (which includes the small weight of the slider). The length of the slider is 30 cm. What is the surface tension of the film? Therefore, the surface tension of the film is 2.5 × 10–2 N m–1. 10.18. Figure 10.24 (a) shows a thin liquid film supporting a small weight = 4.5 × 10–2 N. What is the weight supported by a film of the same liquid at the same temperature in Fig. (b) and (c)? Explain your answer physically. In all the three figures, the liquid is the same. Temperature is also the same for each case. Hence, the surface tension in figure (b) and figure (c) is the same as in figure (a), i.e., 5.625 × 10–2 N m–1. Since the length of the film in all the cases is 40 cm, the weight supported in each case is 4.5 × 10–2 N.
10.19. What is the pressure inside the drop of mercury of radius 3.00 mm at room temperature? Surface tension of mercury at that temperature (20°C) is 4.65 × 10–1 N m–1. The atmospheric pressure is 1.01 × 105 Pa. Also give the excess pressure inside the drop. = [ 2 × 4.65 × 10-1 / (3 × 10-3) ] = 310 Pa.
10.20. What is the excess pressure inside a bubble of soap solution of radius 5.00 mm, given that the surface tension of soap solution at the temperature (20 °C) is 2.50 × 10–2 N m–1? If an air bubble of the same dimension were formed at depth of 40.0 cm inside a container containing the soap solution (of relative density 1.20), what would be the pressure inside the bubble? (1 atmospheric pressure is 1.01 × 105 Pa). Therefore, the pressure inside the air bubble is 1.06 × 105 Pa.
10.21. A tank with a square base of area 1.0 m2 is divided by a vertical partition in the middle. The bottom of the partition has a small-hinged door of area 20 cm2. The tank is filled with water in one compartment, and an acid (of relative density 1.7) in the other, both to a height of 4.0 m. compute the force necessary to keep the door close. 10.22. A manometer reads the pressure of a gas in an enclosure as shown in Fig. 10.25 (a) When a pump removes some of the gas, the manometer reads as in Fig. 10.25 (b) The liquid used in the manometers is mercury and the atmospheric pressure is 76 cm of mercury. Hence, gauge pressure is –18 cm of Hg. 10.23. Two vessels have the same base area but different shapes. The first vessel takes twice the volume of water that the second vessel requires to fill upto a particular common height. Is the force exerted by the water on the base of the vessel the same in the two cases? If so, why do the vessels filled with water to that same height give different readings on a weighing scale? 10.24. During blood transfusion the needle is inserted in a vein where the gauge pressure is 2000 Pa. At what height must the blood container be placed so that blood may just enter the vein? [Use the density of whole blood from Table 10.1]. 10.25. In deriving Bernoulli’s equation, we equated the work done on the fluid in the tube to its change in the potential and kinetic energy. (a) What is the largest average velocity of blood flow in an artery of diameter 2 × 10–3 m if the flow must remain laminar? (b) Do the dissipative forces become more important as the fluid velocity increases? Discuss qualitatively. 10.26. (a) What is the largest average velocity of blood flow in an artery of radius 2 × 10–3 m if the flow must remain laminar? 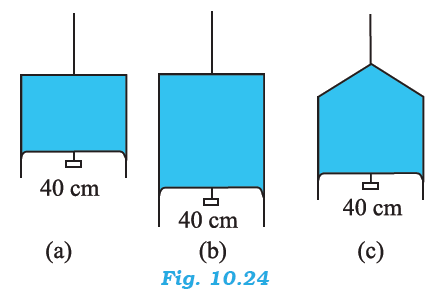 (b) What is the corresponding flow rate? (Take viscosity of blood to be 2.084 × 10–3 Pa s). Therefore, the corresponding flow rate is 1.235 × 10-5 m3s-1. 10.27. A plane is in level flight at constant speed and each of its two wings has an area of 25 m2. If the speed of the air is 180 km/h over the lower wing and 234 km/h over the upper wing surface, determine the plane’s mass. (Take air density to be 1 kg m–3). 10.28. In Millikan’s oil drop experiment, what is the terminal speed of an uncharged drop of radius 2.0 × 10–5 m and density 1.2 × 103 kg m–3? Take the viscosity of air at the temperature of the experiment to be 1.8 × 10–5 Pa s. How much is the viscous force on the drop at that speed? Neglect buoyancy of the drop due to air. Density of air (ρ0) can be taken as zero in order to neglect buoyancy of air. Hence, the terminal speed of the drop is 5.8 cm s–1. Hence, the viscous force on the drop is 3.9 × 10–10 N.
10.29. Mercury has an angle of contact equal to 140° with soda lime glass. A narrow tube of radius 1.00 mm made of this glass is dipped in a trough containing mercury. By what amount does the mercury dip down in the tube relative to the liquid surface outside? Surface tension of mercury at the temperature of the experiment is 0.465 N m–1. Density of mercury = 13.6 × 103 kg m–3. 10.30. Two narrow bores of diameters 3.0 mm and 6.0 mm are joined together to form a U-tube open at both ends.  If the U-tube contains water, what is the difference in its levels in the two limbs of the tube? Surface tension of water at the temperature of the experiment is 7.3 × 10–2 N m–1. Take the angle of contact to be zero and density of water to be 1.0 × 103 kg m–3 (g = 9.8 m s–2). is the density at sea level, and y0 is a constant. This density variation is called the law of atmospheres. Obtain this law assuming that the temperature of atmosphere remains a constant (isothermal conditions). Also assume that the value of gremains constant.